The final results of the competition for the faculty posters held during the International Research Day / Food Day were received! 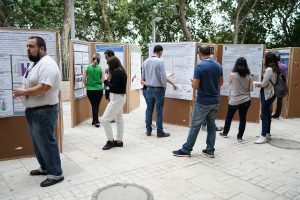 Thanks to the members of the panel of judges: Prof. Amram Mor, Assistant Prof. Esti Miron-Holtz, Assistant Prof. Amit Zeizel, Assistant Prof. Maya Davidovitch-Pinchas, Assistant Prof. Boaz Mizrahi, Associate Prof. Yoav Livni, Assistant Prof. Omer Yehezkeli and Anat Eshel Gur for helping organize the competition. In addition, thanks to Associate Prof. Uri Lesms and Prof.Ben-Zion Levi for helping to decide between pairs of candidates who received identical grades, Assistant Prof. Avi Spiegelman and the faculty staff for organizing a great and productive day. First place: Ina Nefomiashi from the laboratory of Assistant Prof. Maya Davidovitch-Pinchas. Congratulations to the winners! Wish you success in the Technion competition! The prizes will be awarded an awards ceremony and will be held soon in faculty.